There is something magic about food. The last few weeks have been somewhat difficult for me. Nothing too extreme, but I have had a fair amount of work related stress, the stress of Christmas Day, and I am coming up on my first deadline for the next book. Needless to say, I have been a little distracted. Food makes a wonderful escape for me. I am able to get into the kitchen and sort of lose all the baggage that is otherwise weighing me down and just cook. I tell you this because yesterday I got another bit of new of the ‘Family Medical Drama’ variety. My father, who had a triple bypass over the summer, is back in the hospital with a bone infection. They are pumping him with antibiotics to save his foot, where the infection has settle in, and we are hopeful things will go well. When I woke up this morning I decided I needed a little escape, and a great deal of comfort. This is what I came up with. I love baked eggs, grits, and sausage. I decided to find a way to combine all three into a breakfast dish. To begin I made a batch of fresh, homemade breakfast sausage. It is an easy thing to do and I can spice it up anyway I please. Next I whipped up a pot of VERY creamy yellow corn grits. Finally I layered the sausage with some fresh shredded cheese, topped that with grits, and cracked an egg on the top. I baked it in the oven until the egg was just set and … all I can say is this was almost as good as a vacation, and so delicious! 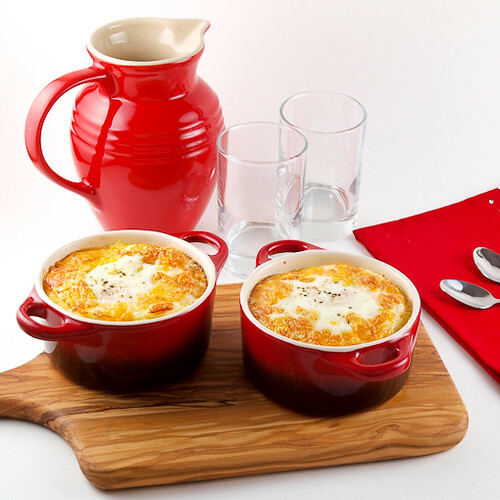 If you wanted to serve this to overnight guests, but you want to sleep in a little yourself, you could make these up in advance, either in a large casserole dish or in individual ramekins like I did, and just bake them off the next morning straight from the refrigerator. They could not be easier, and they are so good! 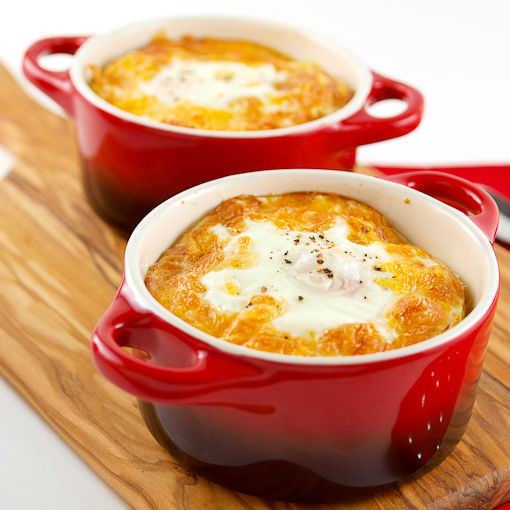 Heat the oven to 350 F and spray 4 – 6 ounce ramekins with non-stick cooking spray. 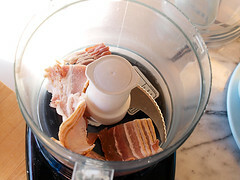 In the work bowl of a food processor add the bacon and pulse until roughly chopped, about 10 pulses. 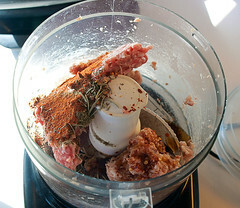 Add the remaining ingredients and process until smooth, but not a paste, about 10 seconds. Heat a medium skillet over medium heat and spray with non-stick cooking spray. 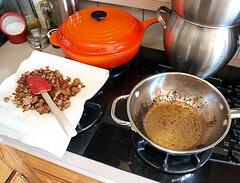 Add the sausage and cook, breaking it up into hazelnut sized chunks. until thoroughly browned, about 15 minutes. Remove the sausage from the pan and drain on paper towels. 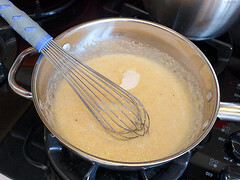 To prepare the grits begin by putting a medium saucepan over medium heat. Add the chicken stock, water, cream, salt, and pepper. 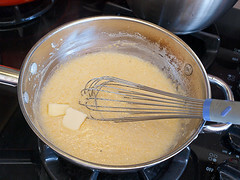 Bring to a rolling boil then reduce the heat to medium low and slowly whisk in the grits. Cook, whisking constantly, until they start to thicken, about 5 minutes. Add the cream cheese and whisk until throughly melted, about 2 minutes. 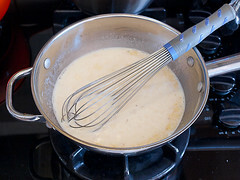 Remove the pot from the heat and whisk in the butter. 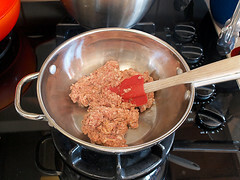 To assemble place 1/4 cup of the sausage in the bottom of the prepared ramekins. 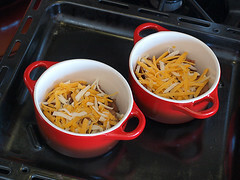 Top with 3 tablespoons of the shredded cheeses, then divide the grits evenly over the cheese. 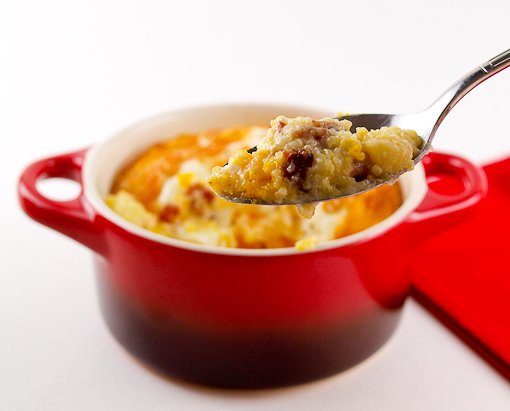 Crack an egg over the grits then sprinkle the remaining cheese around the eggs. Season with sea salt and pepper as desired. 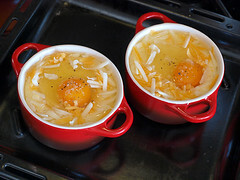 Bake for 15 to 17 minutes, or until the whites are set and the yolk is still runny. 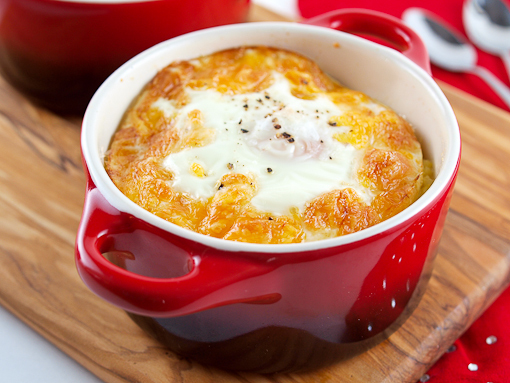 For a firm yolk bake for 18 to 20 minutes.